At bea Skin Clinic, we offer medical aesthetics treatments for women and men of all ages. 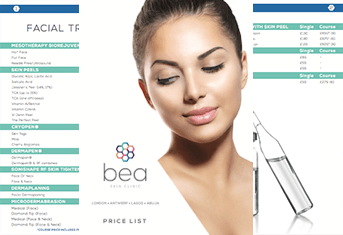 Bringing together a diverse range of skills and treatments in order to provide cutting edge procedures and treatments for all skin conditions, bea Skin Clinic's medical aesthetics price list details a range of options available for those looking to improve their skin. Remaining dedicated to ongoing training and sourcing the most innovative and exciting new treatments and products out there, we are committed to ensuring that your chosen course of treatment is wholly suitable for your individual needs. From your initial meeting through to your treatment and aftercare, bea Skin Clinic's trained practitioners will be there to guide you every step of the way. Simply visit the link below to view prices for the full range of treatments on offer at bea Skin Clinic.